Bringing together technology and people in the workplace seamlessly is the New Way of Working introducing flexibility to employees and increasing staff morale, resulting in productive teams and delivering savings. What determines the success of New Ways of Working Programme? The greatest challenge that is faced by project managers when implementing New Ways of Working is not so much the planning phase of the project but changing the mindset of employees to work better and more productively in locations: Office premises and remotely primarily cultivating efficiency and increasing staff morale within new organisation structures. So the New Ways of Working with open plan offices, hot desks and the use of new technologies will lead to better working styles getting rid of traditional ways of working. Driving this kind of change can become a challenge if not communicated effectively. Communication will not only determine the success of the change programme but also how well change is accepted within teams. It will fundamentally set the foundation and building blocks of how employees work, and accept and embrace the New Ways of Working, realising the potential and enormous benefits; most importantly comfortable with change. Cultural and behavioural aspects of this kind of change will determine the success of New Ways of Working. Top 3 Initiatives when considering New Ways of Working. A good time to implement New Ways of Working would be when an office lease is up for renewal, or your department is looking to re-accommodate. Design seating plans and include hot desks allowing for mobile and flexible working. Introduce Flexible working – No more fixed hours and fixed location. Think about what technologies need to be implemented to enable staff to work remotely. Deploy the right technologies will allow flexible working. With a clear desk policy staff will be able to plug in their laptops and work without the need for clearing desks. Deploying the right technologies will improve collaboration and communication between employees and teams within organisations. 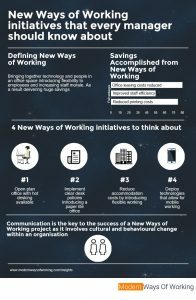 So New Ways of Working is about improving staff morale and changing the mindsets of a workforce to improve the quality of the work and increasing productivity.